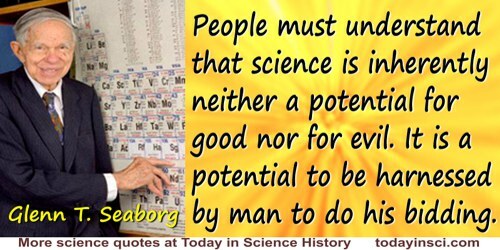 American physicist and nuclear chemist who led his colleagues at the University of California, Berkeley, to produce nine of the transuranic elements (plutonium to nobelium) by bombarding uranium and other elements with nuclei in a cyclotron. 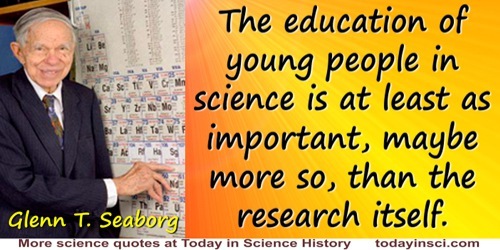 The education of young people in science is at least as important, maybe more so, than the research itself. As quoted in Peter Davies, Success With Words: A North American Guide to the English Language (1983), 52, citing The New York Times. 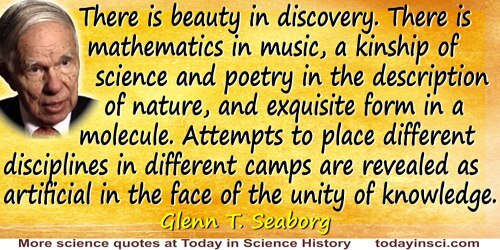 19 Apr - short biography, births, deaths and events on date of Seaborg's birth. Adventures in the Atomic Age : From Watts to Washington, by Glenn T. Seaborg. - book suggestion.